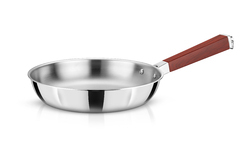 Prominent & Leading Exporter from Ankleshwar, we offer avonware whole body clad stainless steel 20cm triply wok, avonware whole body clad stainless steel 18cm triply frying pan, avonware whole body clad stainless steel 20cm triply frying pan, avonware whole body clad stainless steel 24cm triply frying pan, avonware whole body clad stainless steel 1.0 liter triply sauce pan with glass lid and avonware whole body clad stainless steel 1.5 liters triply sauce pan with glass lid. Combination of Stainless Steel Cast and Wood Texture Bakelite Handle & Knob makes it a Stay-Cool. Handles are fastened with solid Stainless Steel rivets. Glass Lid with double lip rim preserves moisture. Whole Body Clad is a Construction of 3 layers of metals cladded together, with a core layer of Aluminum bounded by layers of Stainless Steel, from edge to edge completely. The inner layer is 304 grade Stainless Steel, which is very ideal, hygienic metal and non-reactive while cooking any type of food. The heavy gauge core layer of electrolytic Aluminum being good conductor of heat, transferring energy from molecule to molecule ensures even heat distribution and heat retention. The outer layer is made of 430 grade Magnetic Stainless Steel with high chrome content which can withstand oxidation and corrosion. Due to its magnetic and conductive properties it makes the cookware compatible with induction top and suitable to cook on any type of stovetop heat source such as Induction, Gas Burner, Electric Coils, Ceramic, Halogens, etc. The construction and structure of cookware eliminates hot spots and ensures even heating across the bottoms of pots and pans and all the way up the side walls of the cookware. This helps in cooking food on low flame at low temperatures helping preserve the natural flavors. Combination of Stainless Steel Cast and Wood Texture Bakelite Handle makes it a Stay-Cool. Works on Induction top and all other heat source top. This is NOT a Non-Stick Pan. Ideal for making Omelette, Stir-Fry, Roasting, Tadka, Grilling, etc Constructed from 3 layers of metals cladded together - Stainless Steel + Aluminium + Stainless Steel.Combination of Stainless Steel Cast and Wood Texture Bakelite Handle makes it a Stay-Cool.Handles are fastened with solid Stainless Steel rivets.Works on Induction top and all other heat source top. This is NOT a Non-Stick Pan. 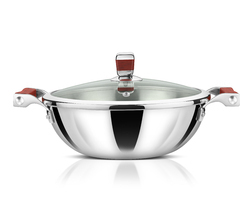 Avonware Whole Body Clad Stainless Steel 1.0 Liter Triply Sauce Pan With Glass Lid - 14cm. 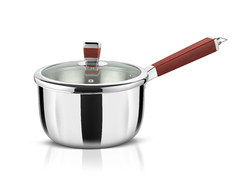 AVONWARE Whole Body Clad Stainless Steel 1.5 Liters Triply Sauce Pan with Glass Lid - 16cm. Ideal for making Omelette, Stir-Fry, Roasting, Tadka, Grilling, etcConstructed from 3 layers of metals cladded together - Stainless Steel + Aluminium + Stainless Steel.Combination of Stainless Steel Cast and Wood Texture Bakelite Handle makes it a Stay-Cool.Handles are fastened with solid Stainless Steel rivets.Works on Induction top and all other heat source top. This is NOT a Non-Stick Pan. Looking for Tri-Ply Cookware ?